Dashrath introduced Raja to guests. The media asked Dhani about the arrangements of Raj bhog. Dasharath told her to speak. Raja got angry as Dhaani and Viplav got importance, not him, where the function was in his honour. Shalu came there and tried to talk to him. Raja told that he was having a headache and wanted some rest. Shalu looked on. Viplav got the mobile and told Dhaani that that she was right that Raja was a womanizer. He called Dadaji, shalu, and Kanak. He showed the video and told Shalu that it was Raja’s truth. He had married for money and showed video. Raja’s mum came. She was shocked. Dhani said that her son was like this only and stated that they know his truth. His mum said that she was lying to make them fall in their eyes and to make them leave. Dhaani said that they had to go. She said they don’t have proof against him. Kanak stated that Raja had ruined her daughter’s life. Raja’s mum said she was lying. Raja came and said he hadn’t ruined shalu’s life and brought Raj Lakshmi holding his hand and stated that he welcome her in Tripathy family. He stated that he wanted to show the truth and took out his wig. Raja said she was Raj Lakshmi. He said that he has understood that she was playing a dirty game with her, and that’s why he tried to get closer to her to bring out their truth in front of all. Raja’s mum smirks. Raja said that woman has betrayed him. Kanak sought to beat Raj Lakshmi. Dhani said we had told Raj Lakshmi to do this drama.Viplav said he told her to act so that Raja’s truth comes out. Raja said that is lie. And that are making stories as their lie is caught. Kanak asked Viplav, why did he play the game with Raja. Viplav asked ok; Raja knew that she was Raj Lakshmi then why did she get closer to her. Kanak scolded Viplav. Dhani said that they had done that to bring out her truth.Viplav stated that you trust me and not Raja.Dasharath got confused. Raja said Dhani had provoked and instigated Viplav against him. Viplav grabbed his collar and scolded him. Raja stated that he can’t hide the fact. Dasharath talked about respect and prestige. He asked Raj Lakshmi to leave from there, far away from their eyesight. Raj Laksmi cried, Dhaani and Viplav apologized to her. Raj Lakshmi felt bad as Rajan proved himself right in front of all. Viplav said he didn’t,t made any mistake. Don.t know what have happened to his family. Dhaani stated that they would drop her home. Raj Lakshmi said she will go, and asked them to go inside. They went inside. I knew about Dhani’s hatred for him. Shalu asked Dhaani to stay far from her daughter else she would break her legs. 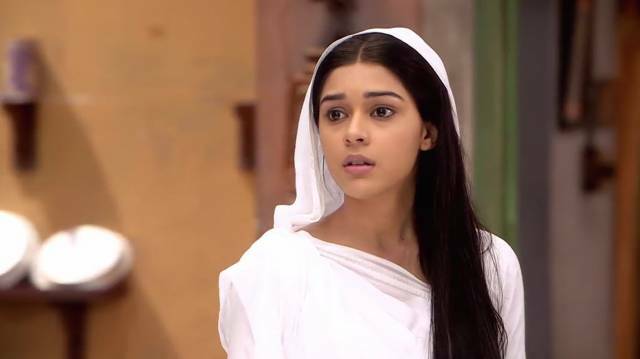 Viplav said she had made a big mistake by trusting Raja. Raja stated that he was leaving the house and has taken the decision to go far from Shalu and all of them. Shalu told she doesn’t want him to stay in the house and said that she will come with him.Viplav looked on.